Boeing 737-3Y0 G-IGOA (cn24678/1853) at Amsterdam IAP, 13Sep02. During 2000 it became known that founder British Airways was putting up Go for sale. 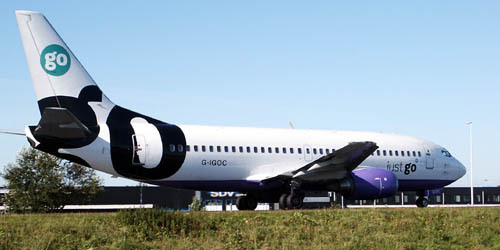 BA realised that they weren't cut out to operate a low-cost carrier and sold Go to the 3i Group. By early 2002 easyJet reached an agreement for the purchase of Go. The sale was made official in August 2002, but it was agreed that Go and easyJet would operate seperately until March 2003. Last flight under Go's callsign was on 29Mar03. By 30Mar2003 Go ceased as a seperate company. In Britain EasyJet faced accusations of betrayal from unions after revealing plans to axe 114 former Go employees, despite promises that its takeover would involve no redundancies. EasyJet said it intended to shut a Go call centre at Stansted airport, leaving its team at Luton airport to handle all telephone reservations. It intends to restrict telephone bookings to flights within seven days, encouraging customers to use the internet. The trade union Amicus reacted with fury, saying it had been given assurances as recently as Monday that Go jobs were safe following summer takeover. Derek Simpson, Amicus general secretary, said: "This is a real slap in the face for Go staff who have been loyal and who have taken EasyJet's assurances that there would be no redundancies from the takeover." Boeing 737-3Y0 G-IGOC taxiing to runway 01L at Amsterdam IAP for take off.